Whether it’s for work or play, Americans are on the road an average of 13,476 miles a year. That’s 37 miles per day. You put in some serious time behind the wheel, so it is no surprise that you’re interested in interior features and technology. Sometimes style is as important as reliability. After all, you want to enjoy driving your car as much as other people enjoy looking at it. The next time you visit Heidebreicht for a new Chevrolet, ask about these features that will turn your car into your own personal oasis. It seems obvious, but the first thing you notice about the inside of a car is the way it feels when you sit inside it. Often people know within the first few minutes of a test drive whether they like a car or not, and three out of five times that is based on the driver’s seat. Chevrolet has ergonomically designed chairs shaped to make riding a pleasure. Discerning drivers have the option to add a front bucket seat with a specially-placed “driver power” lumbar support system. You should choose heated and ventilated seats, especially here in Michigan where our weather can get extreme. Few things feel nicer on a snowy Michigan day than sinking into a toasty driver’s seat. Many of our pre-owned cars and trucks have this feature, so don’t worry about breaking the bank. Give a little consideration to choosing a higher trim level, too. Our base materials are always excellent quality, but there are so many upgrade options available to truly personalize your car or truck. Why not treat yourself to some higher end interior touches? Wood-grain console and door accents are a great way to help your Impala stand out, and these come with most of the upper trims. Leather upholstery is another enhancement which is well worth the investment. Our high-quality upholstery leather is cooler and more comfortable than cloth. It gives your Chevrolet a luxurious feel. Alternately, you could upgrade the touch screen for your MyLink system to a generous seven inches. These days, listening to broadcast radio in the car is a hassle. Every time the station fades you have to search for a new one, and that can be a dangerous distraction for a driver. Rather than deal with that frustration, we bring our music with us, stored right on our phones for easy access. Now you can stream your music from your car speakers. With Apple CarPlay and Android Auto, your phone connects to the car to let you control the apps from your in-dash infotainment system screen. Listen to your own music or stream favorite playlists from Pandora and Spotify. Serious music lovers should consider adding the Bose premium 7 speaker surround sound system. It lets passengers cocoon themselves in crystal-clear sound from any seat in the car. Music isn’t the only feature of your MyLink. Chevrolet MyLink is one of the most intuitive infotainment systems on the market, able to interface with nearly every modern cell phone on the market to help drivers focus on the road, not their phones. Apple users have the edge here; they can access Siri Eyes Free through the MyLink system. Siri Eyes Free can read off and answer texts, switch playlists, and more in response to the driver’s naturally spoken commands. At Heidebreicht in Washington, Michigan, we have the interior features and upgrades you are looking for this year. You already trust us for exacting service standards and technical expertise; now trust us with your comfort. 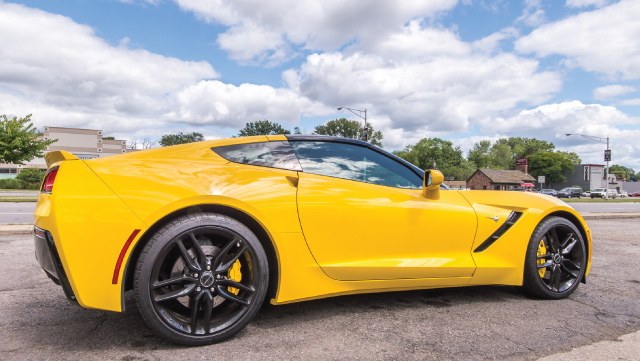 Drop by our location on Van Dyke Road today and get to know what Chevrolet has to offer! This entry was posted in New Chevrolets. Bookmark the permalink.